How Zika Travels to a Fetus—And Can This Drug Stop the Virus in its Tracks? A recent breakthrough could hold the key to preventing Zika's awful effects. By now, we all know that the Zika virus can spell serious problems for pregnant women and their fetuses—most notably causing microcephaly, a birth defect characterized by a baby being born with an abnormally small head and incomplete brain development. But how exactly does the virus reach a fetus, and is there a way to prevent it from doing so? A new study published in Cell Host & Microbe may have answers to those two burning questions. The research, done by a team at UC San Francisco and UC Berkeley, set out to map how the virus is transmitted from mother to baby. "Very few viruses reach the fetus during pregnancy and cause birth defects," study lead researcher Lenore Pereira, a virologist and professor of cell and tissue biology in the UCSF School of Dentistry, said in a news release. Professor Pereira also pointed out that gaining a strong understanding of how Zika is able to reach the fetus is key to dealing with the virus, saying this "may be the most essential question for thinking about ways to protect the fetus when the mother gets infected." The researchers discovered that Zika has the ability to infect multiple cells in a woman's placenta and amniotic sac, which protects and encompasses a fetus within the womb. They also determined that the virus can take one of two routes when infecting a fetus: It can travel a placental route, which is established during the first trimester of pregnancy—or it can be transmitted via the amniotic sac, which can only happen once the second trimester is underway. Here's one important (and reassuring) takeaway from the study: Researchers found that an antibiotic called duramycin blocked the virus from replicating in the types of cells that may carry the virus on both of the aforementioned routes. Duramycin has previously been identified as an antidote to dengue and West Nile viruses. Both of these viruses are flaviviruses, as is the Zika virus. 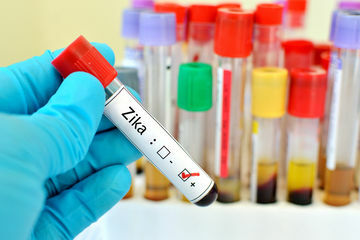 More research is necessary, but the team believes they're onto something here: "Duramycin or similar drugs could effectively reduce or prevent transmission of Zika virus from mother to fetus across both potential routes and prevent associated birth defects," study co-author Eva Harris, a professor of infectious diseases and vaccinology at the University of California, Berkeley's School of Public Health, said.